The structure is set up annually for the Bakersfield Business Conference which attracts over nine thousand attendees. Two dramatic American flags punctuate the design of one of the largest clear span temporary facilities ever constructed. The one-of-a-kind tension fabric structure, manufactured with Shelter-Rite® architectural fabric by Seaman Corporation, covers an area encompassing over 100,000 square feet, or the equivalent of four football fields. The structure is set up annually for the Bakersfield Business Conference, held by the law firm of Borton, Petrini and Conron, LLP, of Bakersfield, CA. The conference attracts over nine thousand attendees including world leaders in politics, business and entertainment. Designed and manufactured by Universal Fabric Structures, the structure measures 314 feet by 380 feet and stands 80 feet tall. Each of the flags incorporated into the design measures 133 feet by 340 feet and is capable of covering one football field. To provide absolute assurance of color and dimension quality, Seaman Corporation wove the specific U.S. flag colors into Shelter-Rite architectural fabric panels used to create the outer layer of the structure's shell. Shelter-Rite architectural fabric Style 8424 was picked because of its ability to withstand the stresses of the massive spans as well as winds up to 85 mph. The fabric can also withstand the rigors of the annual setup for the conference. The installation of the 328,000-pound structure requires eight men working about thirty days with an impressive collection of aerial erection equipment. 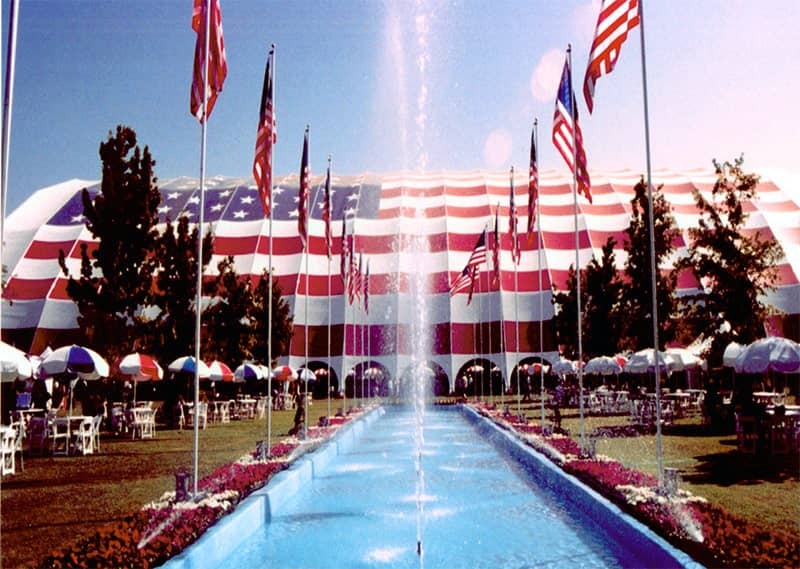 During the process, the Shelter-Rite architectural fabric panels must be perfectly aligned to match the stripes on the American flags. Once assembled, the tension fabric structure becomes the perfect setting for "America's Premier One-Day Business Conference," held in a building that provides a clear view for virtually every attendee.